For the first time in the long-running series, Dynasty Warriors will be an open world game. Up until now, battles would happen in sections of the map, with players unable to go wherever they like to kill swarms of warriors. 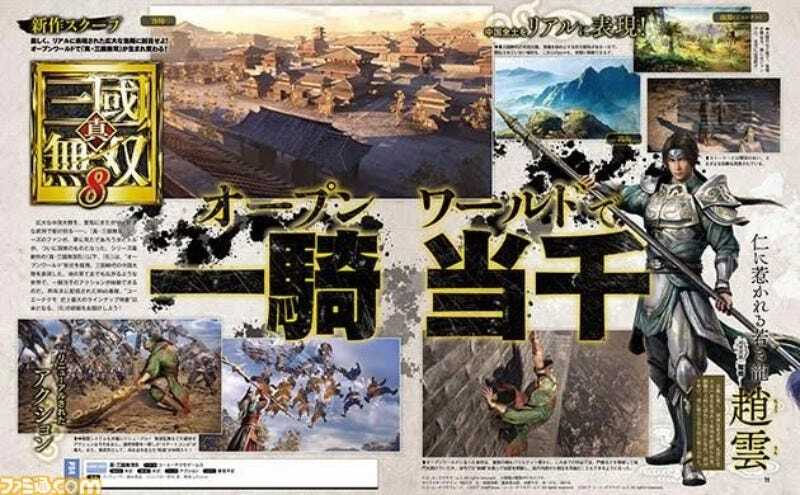 According to the latest issue of Famitsu, Dynasty Warriors 9 (Shin Sangoku Muso 8) will still have massive enemies and massive hack-and-slash battles as well as the sniping down baddies from afar, scaling walls with ninja grappling hooks, and infiltrating enemy castles. Besides new characters, the game will have other revamped features, which will probably be revealed at a later date. So far, the game has been announced for the PS4. No word on Famitsu.com as to when the title is slated for release.